I went for a Buddha Box package which included the high definition videos through Vimeo and the bust itself shipped (pretty quickly i may add) from Painting Buddha HQ in Germany. 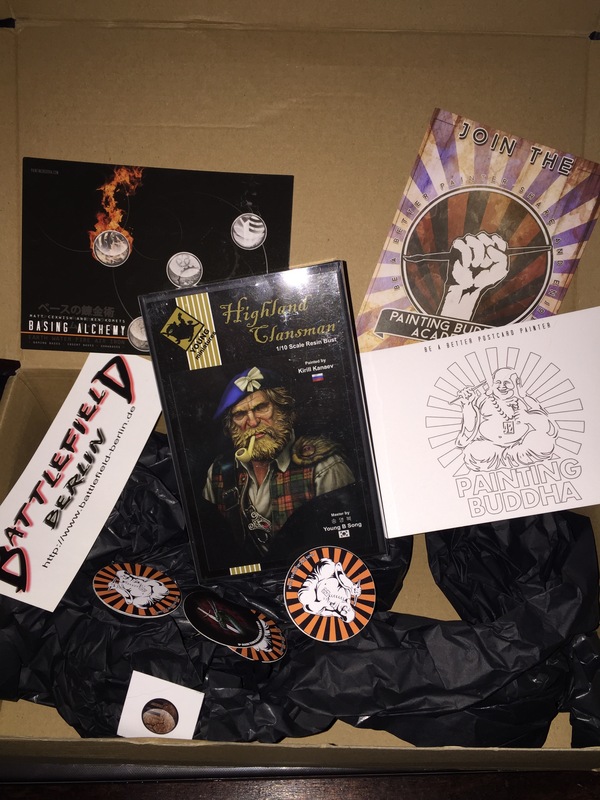 The artist this time was Kirill Kanaev, a world renown miniature painter and the bust was the Highland Clansman by Young Miniatures. I am excited to get going on this and intend to go through each video and do a post at each stage with my thoughts and experiences for good measure. 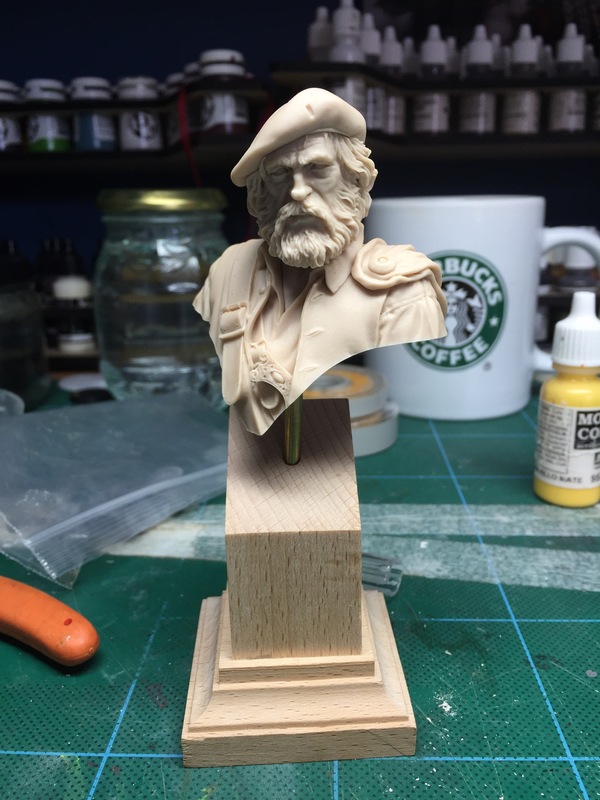 Of particular note are the realistic skin tones Kirill always seems to achieve and also the amazing tartan he has created on this bust… Quite a challenge! I must say that I always love getting loads of stickers and postcards in my orders – sometimes its the little touches that make a big difference (oh, and thanks to Jack Crowe for packing my goodies – expert packing skillz right there…). He comes in 5 parts including some tiny details like the pipe and bow that really bring the piece to life. 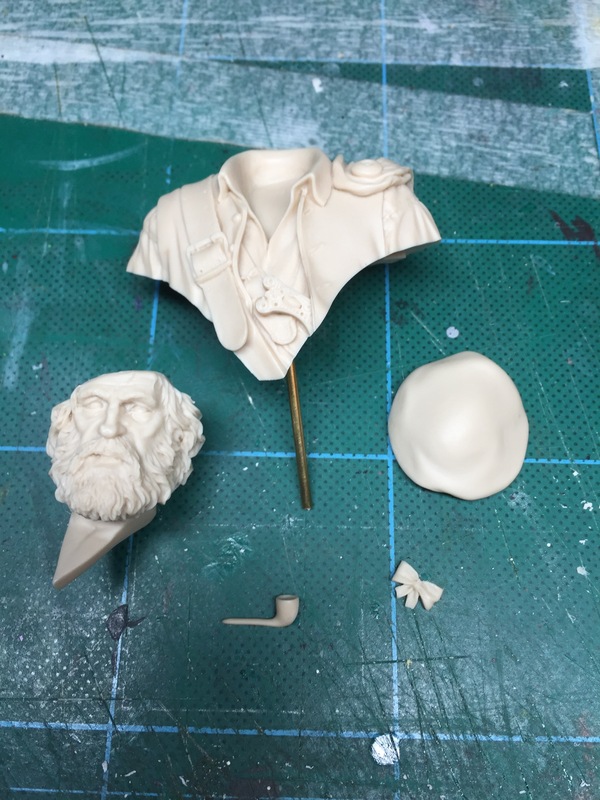 The first step was preparation (as usual), and I prepped the bust at the same time as I did a couple of other miniatures and apart from a couple of larger blocks of resin there really wasn’t much to clean up. This contrasted hugely with the amount of extra work involved in cleaning up the 30mm miniatures , which, although they are lovely sculpts had some nasty mould lines and awkward flash. This Young Miniatures bust was a dream to prep and has such fabulous character. The Plinth is from German manufacturer Sockelmacher and was pretty much perfect for this job. He still needs a wash in some soapy water and then glueing together… once that’s done, I’ start working my way through Kirill’s tutorial and get some photos to share. hi,can i buy this dvd From you? Hi Ich – sorry but I can’t sell it. I only have my access to the video and no license to distribute it.